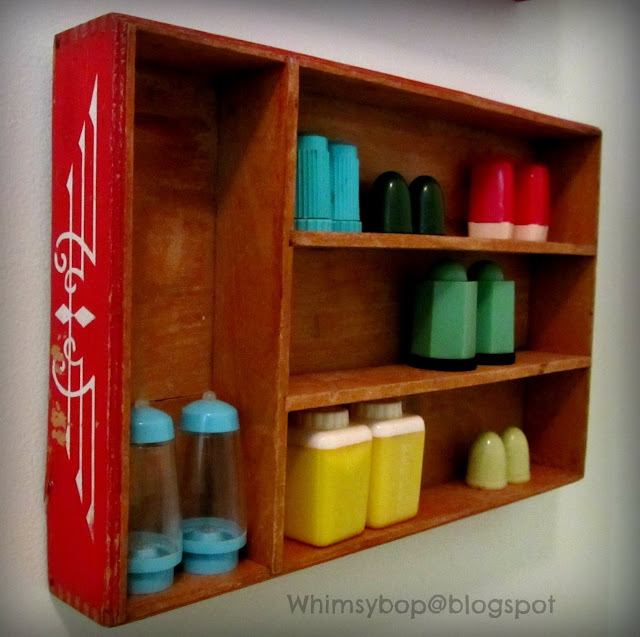 Whimsybop: What to do with an old utensil tray? Back in July, I wrote a post called "Please pass the salt" where I shared about my Salt & Pepper collection and complained about not having a way to display my numerous S&P shakers. One reader suggested that I display them in my old pop crates - now that was a GREAT idea! 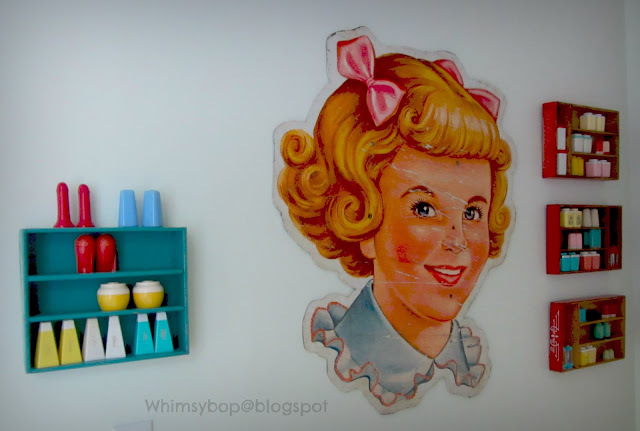 I gave it some thought and figured out I wanted to display them on the wall of my newly remodeled butler's pantry. Since the space is long and narrow I realized the pop crates would be too big and chunky for such a small space - so I had to go back to the drawing board. 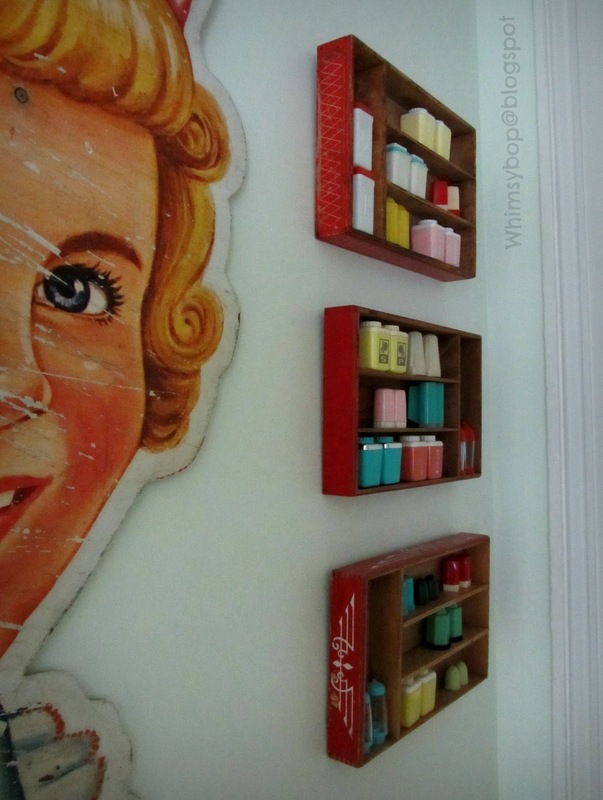 It came to me that I already had the perfect solution: a few vintage utensil trays that I had picked up through the years that were being used around the house in various drawers organizing things like pens, pencils, scissors and make-up items. 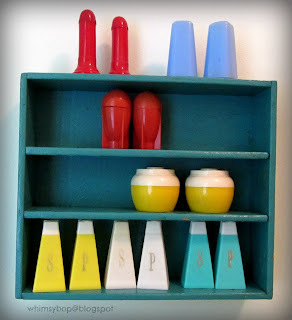 I gathered them up, gave them a good cleaning, flipped them over and rigged up a way to mount them to the wall - and voila' my S&P shakers are now on display! I purchased these red utensil trays at flea markets and thrift shops for under $10. Red utensil trays seem to be the most popular making the price more affordable. I've seen blue and green vintage utensil trays at antique shops - some as high as $35. Although I'd LOVE to have more colors on my wall, that's still too pricey for this girl's budget. This cute aqua tray was something I recently picked up at a junk shop in Amherst, Virginia - for $13 it was well worth the money since I didn't have to paint it! What a great way to display your collection.